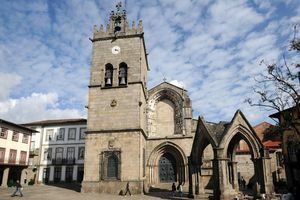 Discover the Nossa Senhora da Oliveira Church in Guimarães, Portugal. This church was founded by the Countess Mumadona during the 12th century and rebuilt four centuries later. It is located in Largo da Oliveira, within the historic city center and it has been classified as a national monument since 1910. In front of the church you can find a magnificent monument, which is a Gothic temple with a huge cross. According to a legend, the monument marks the spot where Visigoth Wamba (who defeated the Suebi) held his spear in the ground as a refusal to rule, unless there was born a tree... That erupted in the next instant. Around the cloister is the Alberto Sampaio Museum. Largo da Oliveira, Guimarães, Portugal. Monday to Saturday, 8:30am –12:00pm and 3:30pm – 7:30pm. Sundays: from 09:00am to 1:00pm and 5:00pm to 8:00pm.